Balkans & Beyond, Day 6: Vienna, Austria. As mentioned earlier, when Vienna began to get too big for its boundaries after industrialization fueled population growth, Emperor Franz Josef I coined the phrase that Ronald Reagan would use on Mikhail Gorbachev more than a century later: "Tear down this wall!" Around 1860, the fortifications surrounding the city were demolished, and the emperor established a development fund, inviting international architects to compete for the opportunity to help determine the face of the new metropolitan Vienna. Franz Josef ordered the walls replaced with an expansive new boulevard, cleverly named Ringstrasse (Ring Road). 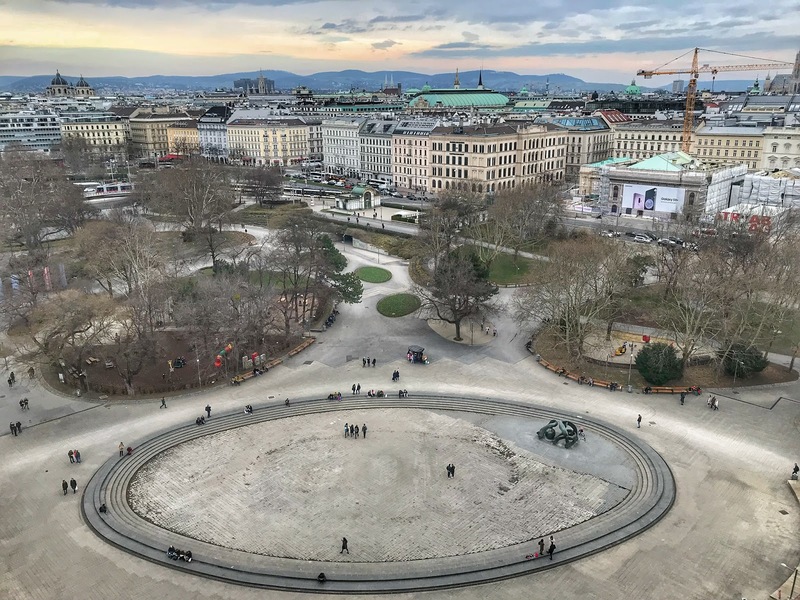 In his vision, the Ringstrasse would be lined with impressive buildings befitting the capital city of Europe's second largest empire. Architects were eager to get on board with his plans. By the end of the competition, some 85 projects had been proposed, and many were approved and built over the course of the next 50 years, encircling the city center with a string of opulent edifices. 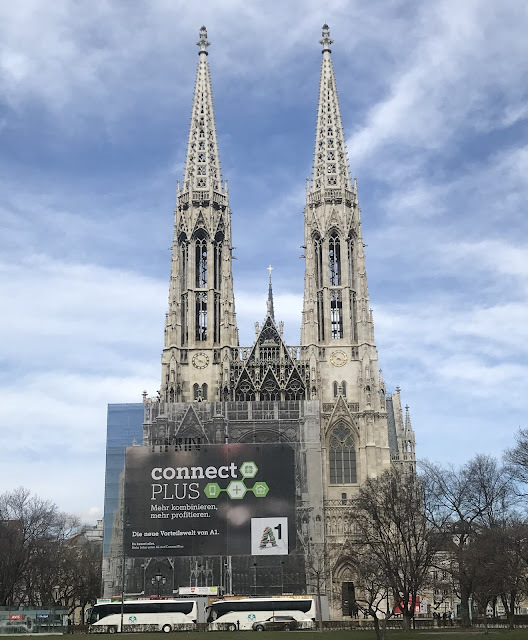 Today we strolled most of the four-mile ring to check out some of Vienna's architectural masterpieces. 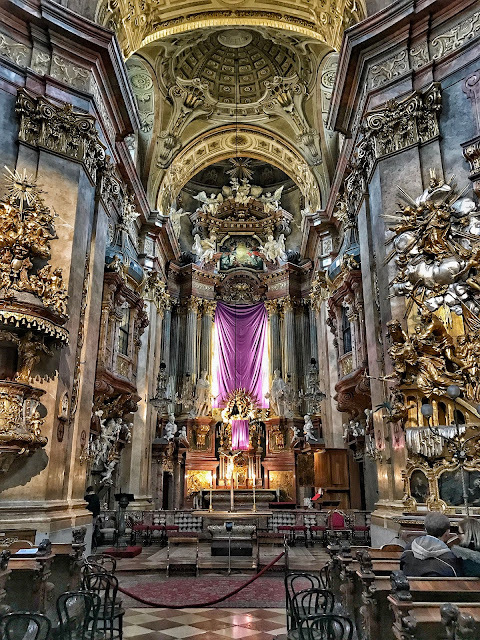 There are far too many to visit even a fraction in one day, so we tended to pop in and out a few of the street's churches, whose open doors offer easy accessibility without committing several hours, as a museum or government building would require. 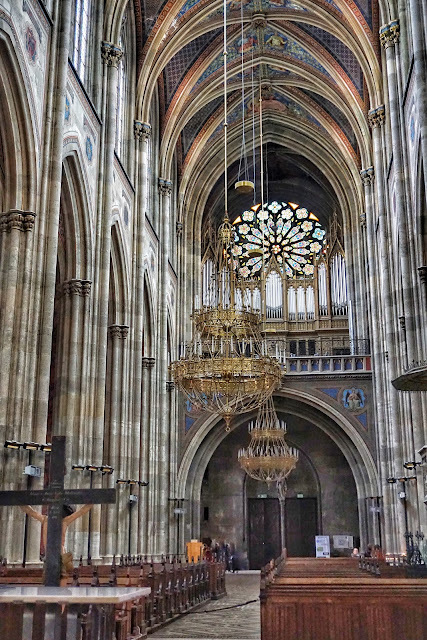 After an unsuccessful assassination attempt on Emperor Franz Josef in 1854, his brother Archduke Ferdinand Maximilian (later Emperor of Mexico) organized efforts to erect a classical Gothic church as an expression of gratitude for his brother's life being spared. 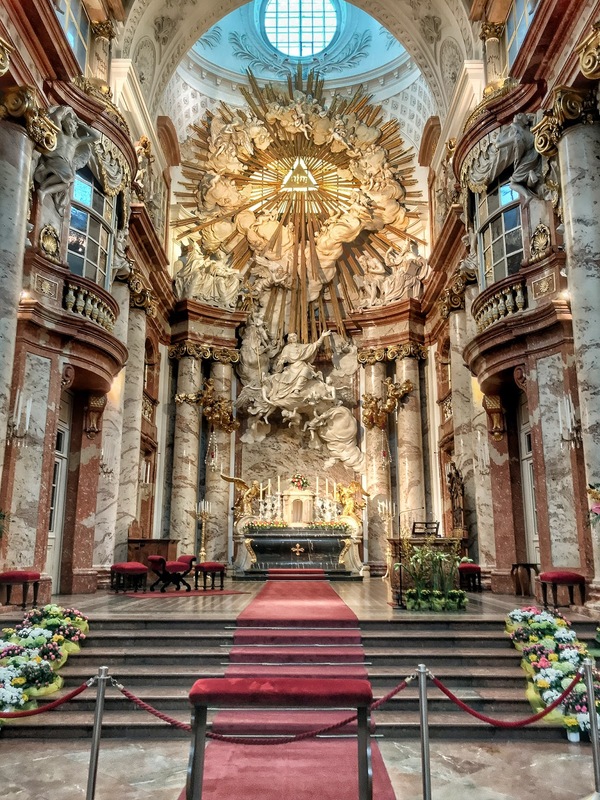 Due to its location, the Votive Church has also been called the Ringstrasse Cathedral. The Votive Church's altar was built in Belgium in the 1400s and is considered to be the most outstanding surviving example of an Antwerp Altar. Today the church's pastoral staff focuses on ministering to tourists and holds Sunday masses in numerous languages. 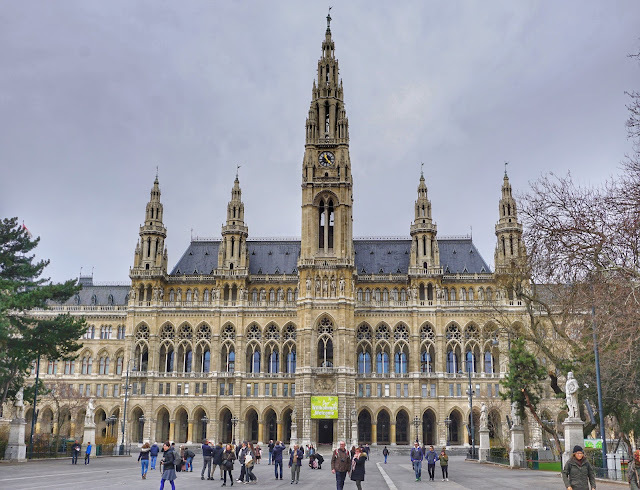 Our next stop was the most important neo-Gothic secular building in the city, Vienna's City Hall. Designed by the architect of the Cologne Cathedral, the massive structure was completed in 1883 after 11 years of work. The City Hall is the seat of the Vienna mayor and the meeting place of the city senate. 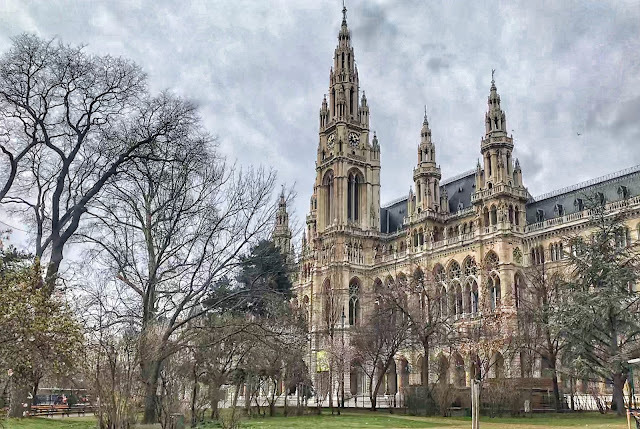 In addition to city government, the Vienna City and Regional library and archives are also housed in the spacious edifice. Directly across the plaza from City Hall sits the Hofburg Theatre. In the early 1700s, Austrian Empress Maria Theresa (mother to the tone-deaf Marie Antoinette of French fame) decided she wanted a theater next to her palace. Of course, her wishes were fulfilled in the construction of an opulent theater which opened in 1741. 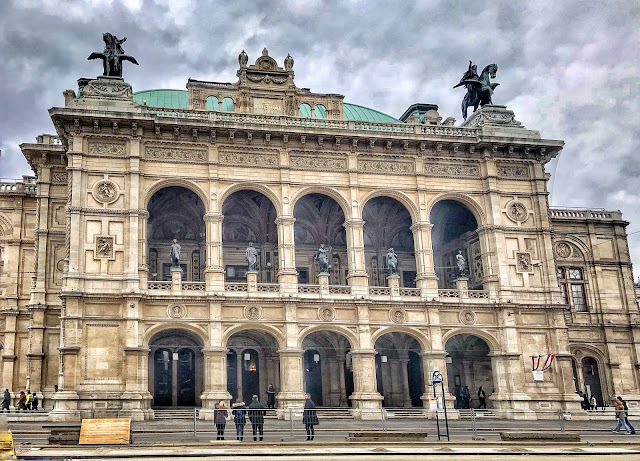 During the development of the Ringstrasse, Emperor Franz Josef ordered a new home for the Hofburg Theatre, celebrating its opening just five years after City Hall was completed. Destroyed by bombing in World War II, the theater was rebuilt in the 1950s. 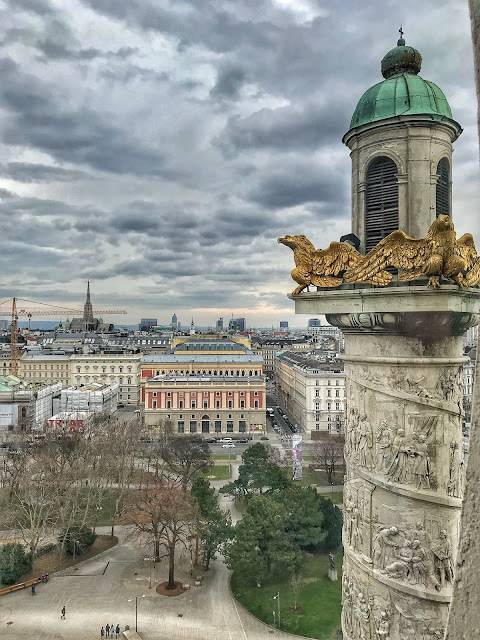 Continuing on our meandering, we walked past the Austrian Parliament building next door to City Hall, but it's currently undergoing a major restoration project and was shielded from view by construction materials and temporary offices. So we walked on, making our way past Hofburg Palace, where Maria Theresa's first theater was built. Erected in the 1200s, the palace has been expanded and renovated many times. 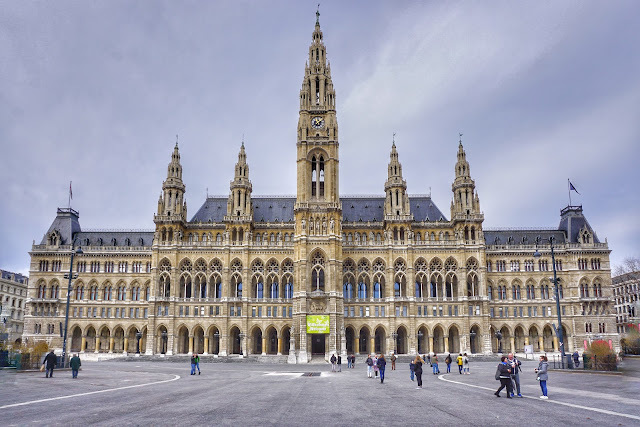 Originally it served as the winter palace of the Hapsburg royal family. Today it houses the residence and offices of the President of Austria. With Vienna the center for classical music, the Opera House was the first building commissioned on the Ringstrasse. 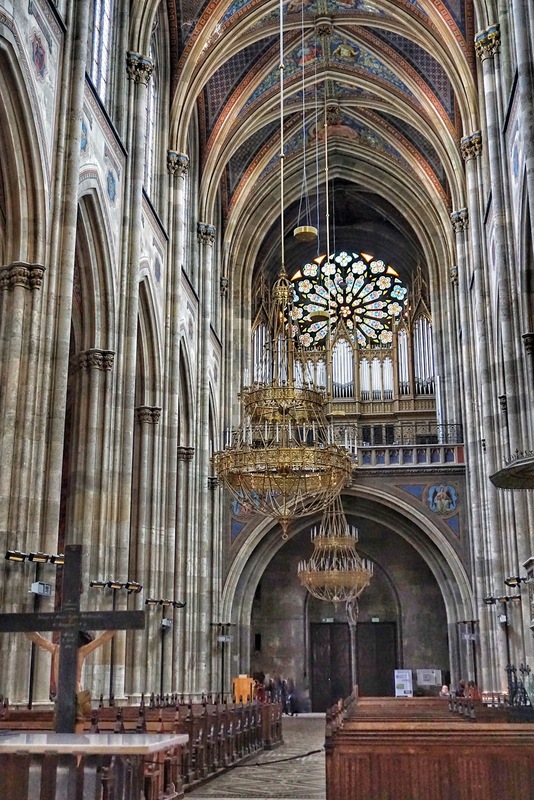 Completed in 1869, the structure was designed in Neo-Renaissance style by a Czech architect. 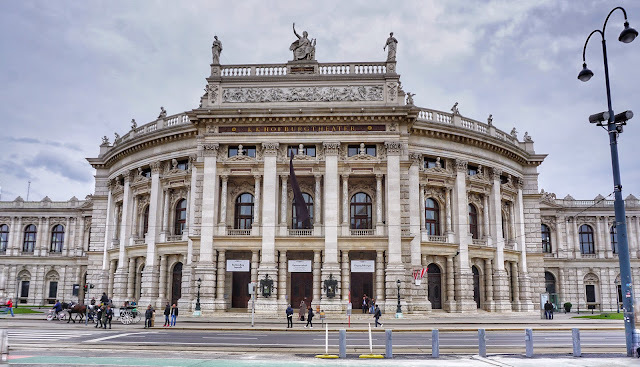 We were quite interested in the opera house because both Ken's parents were enthusiastic opera fans and grew up in Vienna attending performances with their parents. Our eagerness to visit the inside flagged when we learned that the original building was set on fire by a 1945 American bombardment. After the war it was completely rebuilt in a style similar to the original, so this was not, after all, the place of parental opera visits. And on we walked. 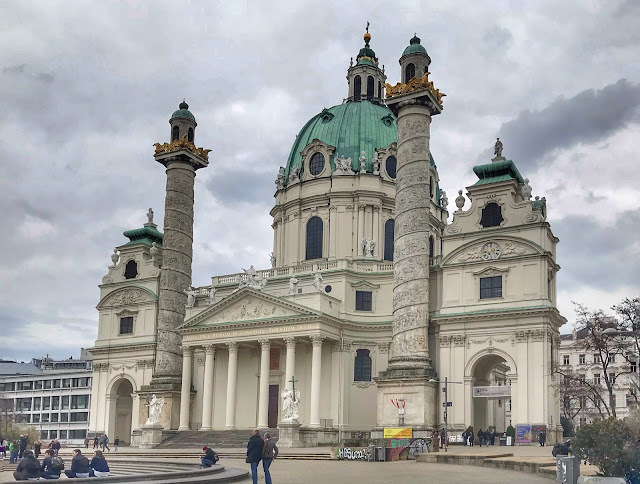 Our next ecclesiastical stop was at Karlskirche (in English, Church of St. Charles), considered one of the city's best examples of baroque architecture and among its greatest buildings. 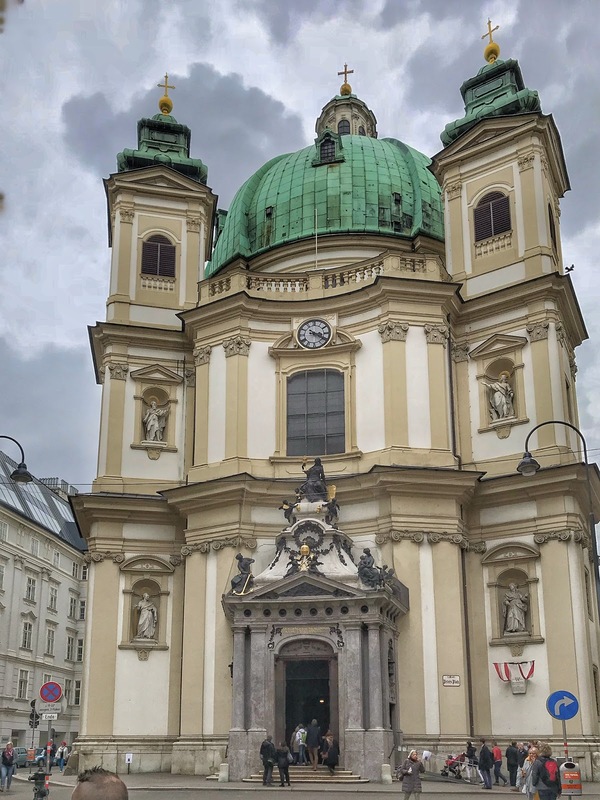 Predating the Ringstrasse, Karlskirche was consecrated in 1737. The interior's colorful array of impressive sculpture is crowned by a cupola covered with exquisite paintings of heavenly scenes. 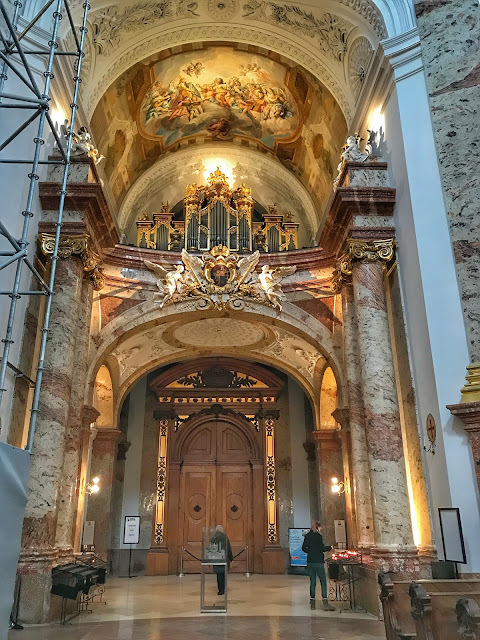 A modern steel scaffold-like structure plopped down incongruously in the sanctuary houses an elevator that lifts visitors to a height of 110 feet for close up views of the ceiling frescoes and a panoramic view over the city. Finally beginning our return trip to our hotel, we left the Ringstrasse and walked down Kartnerstrasse, a pedestrian zone encompassing one of Vienna's most popular shopping areas. 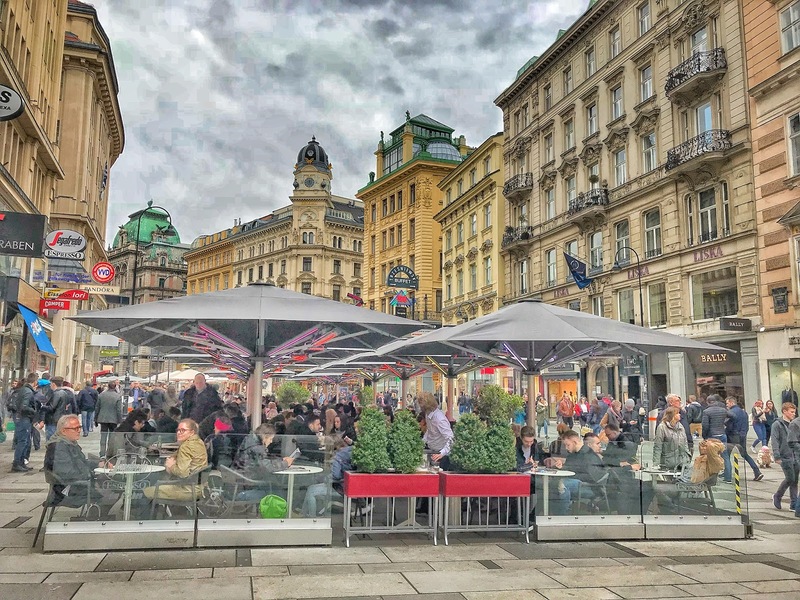 Sidewalk cafes were filled to capacity as locals and tourists enjoyed the beginning of Easter weekend. 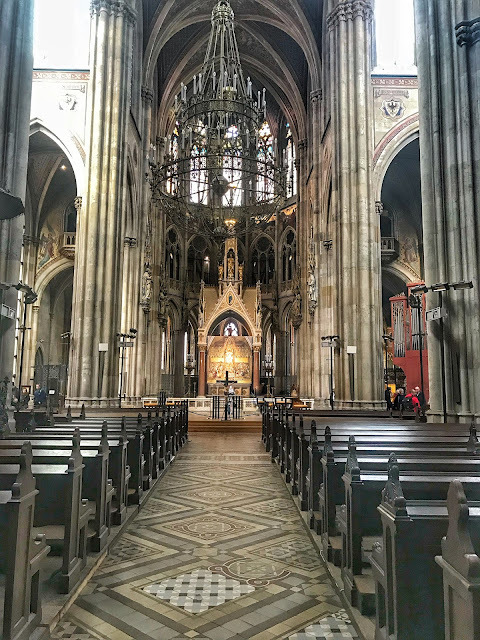 Before stopping at a grocery store for supplies since all will be closed tomorrow when we arrive in Bratislava, we couldn't resist popping into one more of Vienna's churches along our path. Another example of Baroque ecclesiastical architecture, St. Peter's Church was begun in 1701 and consecrated in 1733. Due to its small building lot, the church was built in a compact form but its design and name were inspired by St. Peter's Basilica in Rome. Inside the extensive use of gold stucco and elaborate sculpture combine with Italian paintings to create an interior worthy of its namesake. A recent renovation project restored paintings to their original colors and brightness. In addition to groceries, we purchased train tickets while on our excursion. 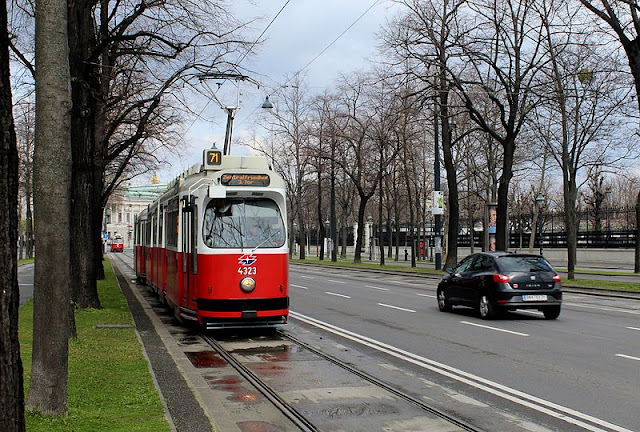 Tomorrow we leave Vienna for a few days in Slovakia's capital city of Bratislava, only an hour away by rail. Loved: Getting better acquainted with the city and marveling at the vision of its 19th century emperor. 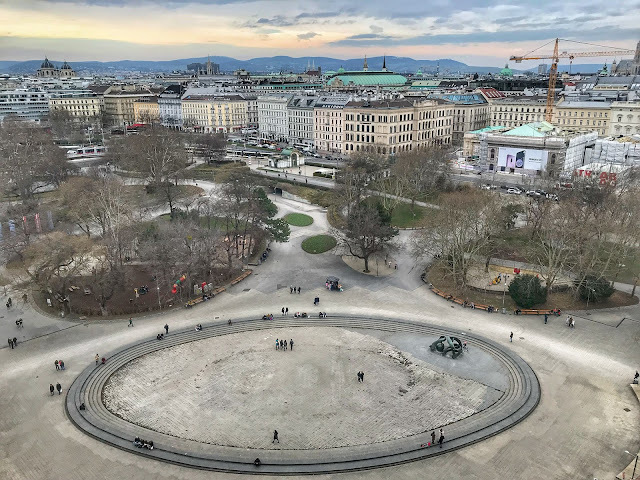 Lacking: Adequate time to visit more of the Ringstrasse's magnificent buildings. 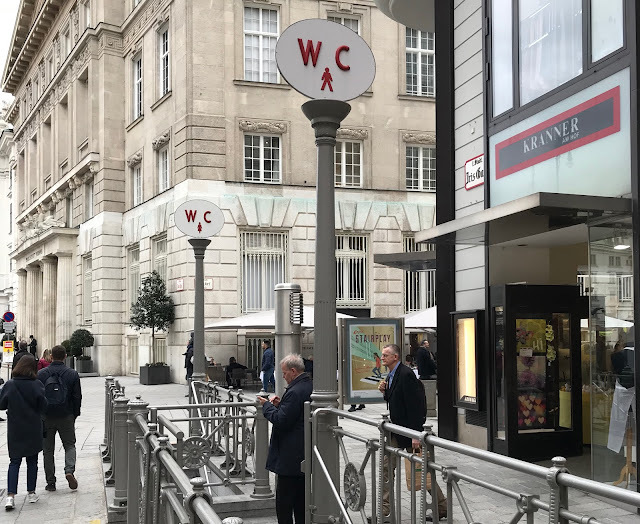 Learned: Vienna has a clever service we've never seen before in all our travels. Around the city are posted metal containers labeled "Found Box." In these receptacles, people can anonymously deposit small items they have found. The city's Central Lost and Found Service organizes the submitted items and makes them available to owners seeking things they have lost. 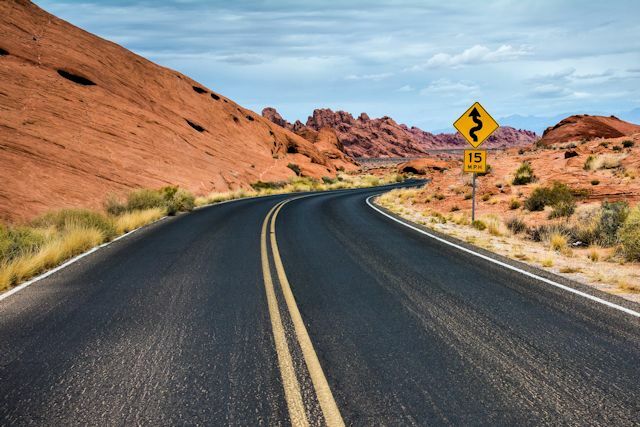 • 10 percent of the value of lost items: These are movable items that are missing from someone’s possession (e.g. keys found on the pavement). • 5 percent of the value of forgotten items: These are movable items that were left in a place by the owner by mistake (e.g. a purse/wallet on a bus or train). 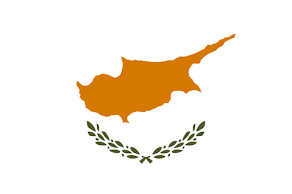 "The above-mentioned percentages are reduced by half if the value of the lost item is more than EUR 2,000. If a found item is not recovered by the owner within six months, the finder becomes the new owner of the item. She or he can, however, also refuse ownership." We looked unsuccessfully for a letterbox in the park adjacent to City Hall. Karlskirche organ and a view of the elevator's steel frame. 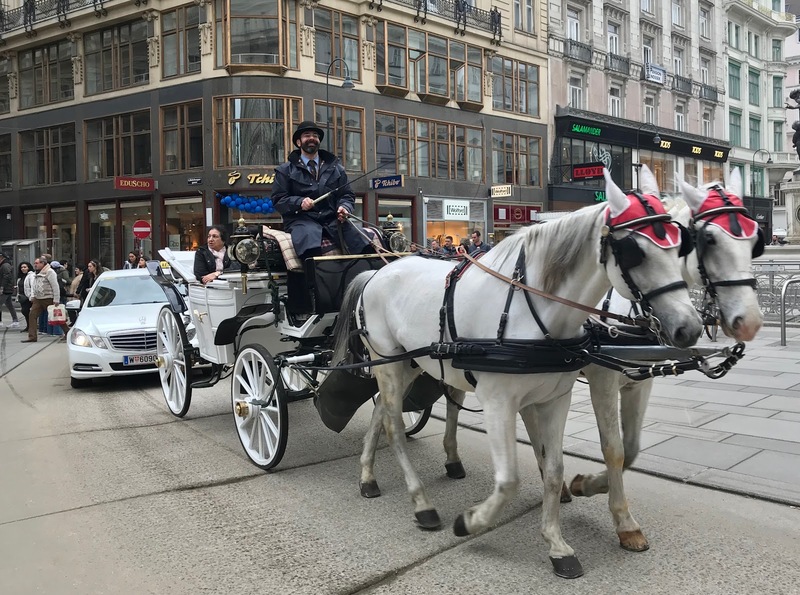 One of dozens of fiakers (horse-drawn carriages) that take tourists around the streets of Vienna's Old Town. In busy areas, the city offers plenty of clean, attended underground toilet facilities, a bargain at 50 cents.